Look! On the pedal board! It’s a bird, it’s a plane! No, it’s the Super Chorus! Oh sure, you say, isn’t this the CE-5? And we’d say no, this is the CH-1. What’s the difference? Where the CE-5 has high and low filters, the CH-1 has an EQ control. Splitting hairs maybe? Well, does your guitar have a single tone control, or one for highs and one for lows? That might help explain the difference. 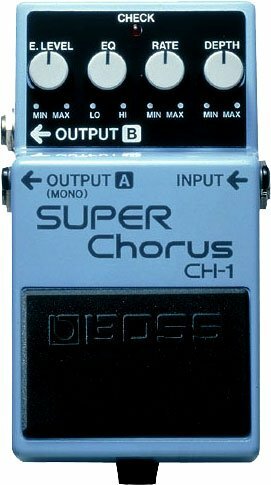 Some say the Super Chorus has a more classic sound, you know, from way back in the 80’s. The CE-5 is also a bit quieter, with a lower output impedance than the CH-1. The differences are subtle, but they are there, and it’s up to you to make the call.